Former US Democrat presidential hopeful Hillary Clinton recently joined the chorus of politicians calling Virginia Governor Ralph Northam, a Democrat himself, to resign over controversy sparked by the emergence of a 1984 photo from his yearbook that features two people, one wearing blackface while the other is clad in a KKK robe. "This has gone on too long. There is nothing to debate. He must resign," Hillary tweeted in response to a media report about both Virginia’s senators urging Northam to resign. — Hillary Clinton (@HillaryClinton) 3 февраля 2019 г. ​Her statement, however, evoked a mixed reaction on social media: while some seemed inclined to agree with Hillary, others focused their attention on controversy surrounding the 2016 presidential candidate. There is nothing to debate. — Left Is Not Right (@thelefteater) 3 февраля 2019 г. As soon as you "Cough up" dem Emails, He will resign. But you 1st. — David (@David77111F) 3 февраля 2019 г. — Mr. Weeks 🤴🏾 (@MrDane1982) 3 февраля 2019 г. 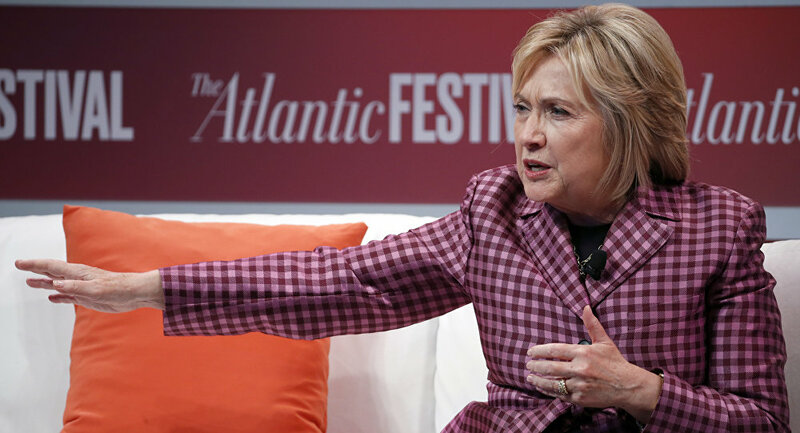 ​A number of people also recalled certain aspects of Hillary’s past, including her support of Northam’s election campaign and her relationship with Robert Byrd, a former high-ranking member of the Klan. Let me remember Hillary called blacks predators went on stage and participated in a blacks are always late because they are lazy joke and recently said they all look alike and don’t forget senator bird the kkk grand wizard who Hillary called her mentor. — Rich and Greedy (@richandgreedy) 3 февраля 2019 г. — MediaMan2009 (@MediaMan2009) 3 февраля 2019 г.
https://t.co/xaXA5a80ki Let us remember that Northam was her buy-out! — Joshua Brown (@JoshuaBrown2040) 3 февраля 2019 г. ​Hillary Clinton’s calls were also echoed by New York Rep. Alexandria Ocasio-Cortez, who tweeted that “Northam must resign, and those who try to help him stumble past this deserve scrutiny”. — Alexandria Ocasio-Cortez (@AOC) 3 февраля 2019 г. ​But while Ocasio-Cortez urged people to try and understand “how painful + eroding this is to American society, let alone the state of Virginia”, there were those who apparently did not see eye to eye with her on this matter. — TRUTHTELLER (@LouisHaskett) 3 февраля 2019 г. It was 30 years ago. I don’t mind him resigning. But if we don’t allow people to evolve, then there is no point of people evolving. — Anthony G. Nixon (@an9on) 3 февраля 2019 г. This mob mentality of stoning anyone who made a mistake at any point in their life is not healthy. People need to be able to apologize and to have that apology accepted. Especially when the events were 25 years in the past and behavior has changed. — Michael Novogratz (@novogratz) 3 февраля 2019 г. ​Meanwhile, Republican Senate Majority Leader Mitch McConnell also ended up being thrust into the limelight amid the Northam scandal, after a photo of the former posing in front of a Confederate flag emerged online. — ChuckVoellinger (@CVoellinger) 2 февраля 2019 г. ​According to Time Magazine, the picture was taken sometime in the early 1990s at a Sons of Confederate Veterans event. This development prompted social media users to debate whether McConnell should be pressured to resign as well. So what’s the difference here between him and the Governor in question, party? — @_thompsonja (@tho72876932) 3 февраля 2019 г.
Sooo… Condemning a yearbook photo from 30 years ago is ok, but a political photo from 30 years ago is over the top? What happened to the same standards for similar things? Why not just condemn it all? Oh, then Mitch would have to call for his own resignation as well. — Peter Scholz (@PeterScholz16) 3 февраля 2019 г. But him and his colleagues including @GOPLeader are crying for Northam to resign for his racist pic from 35 years ago? The hypocrisy in the Republican party is deep. They all should resign. Northam, McConnell, Steve King, Steve Scalise, Cindy Hyde Smith, every last one of them. — Lisa R (@Invisible_Ride) 3 февраля 2019 г. So maybe he should resign, then. Or is what Northam did 30+ years ago somehow different? — Elon Muskrat Love (@Gojira94549) 3 февраля 2019 г.